To import markers data from an Excel spreadsheet file. 1) Upload an Excel spreadsheet file. - Click "Import an Excel File" tab. Browse to Excel spreadsheet file and upload it. - The uploaded data will be displayed in the table(ref: pic2-A) for checking. - The following options can be set before start data importing (ref: pic2-B). Show info window on: Set the info window to show on Mouse Click, or Mouse Over. - pic2-C*: Select the spreadsheet column(s) with markers' info window (popup window) content. 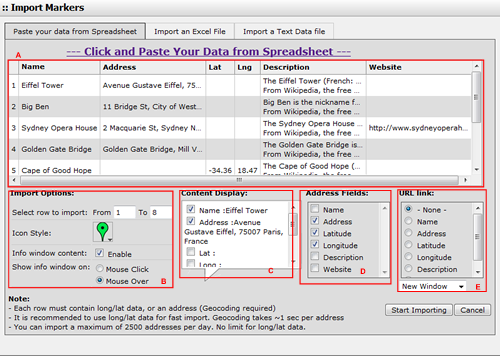 - pic2-D: Select the spreadsheet column(s) with markers' address data.